A lot of things have changed since my last blog post. For one, I have resumed office.And as I write these lines sitting in my office, I could not be more thankful to the government for being such a liberal employer. There are multiple reasons for that: I got six months of maternity leave, got nearly all my hospital expenses covered and now that there's nobody I could leave my baby with, am even allowed to take her along to the office. An outsider to the system may smirk at this but then as civil servants living in a city far from our respective home-towns, there wasn't much else me or A could do about it. Cooperative as our baby has been, bringing up a kid without grandparents, drains the last reserves of one's energy and patience. Add to that the constant fire-fighting which has become the quintessence of government functioning in India and one is left gasping for breath. By the time I write this, I shudder to even mention about the woes faced by a young couple in keeping the house running without any full time support. Weighed down with these and a dozen other concerns, the posting of a dear friend An in Kodagu came as a whiff of fresh air and an opportunity we could not afford to miss. While A showed immense enterprise in getting the reservations and bookings done in a matter of hours, the generosity of the invitation extended to us was no less commendable. While it wasn't our maiden trip to 'the Scotland of the East', the sheer diversity of the landscape with a change of every few kilometers meant our holiday was not going to be bereft of discoveries and surprises.I often wonder how little we knew about the place till not so long ago. Even if one were not to visit, it is difficult to understand, how a place with culture and history as distinct as this, could be unknown to us for so long. Even if it were not for the 'charm' of the place, the fact that we were welcomed by a bright sky full of fluffy white clouds, I could not help but christen this place as 'the Kingdom of Clouds'. 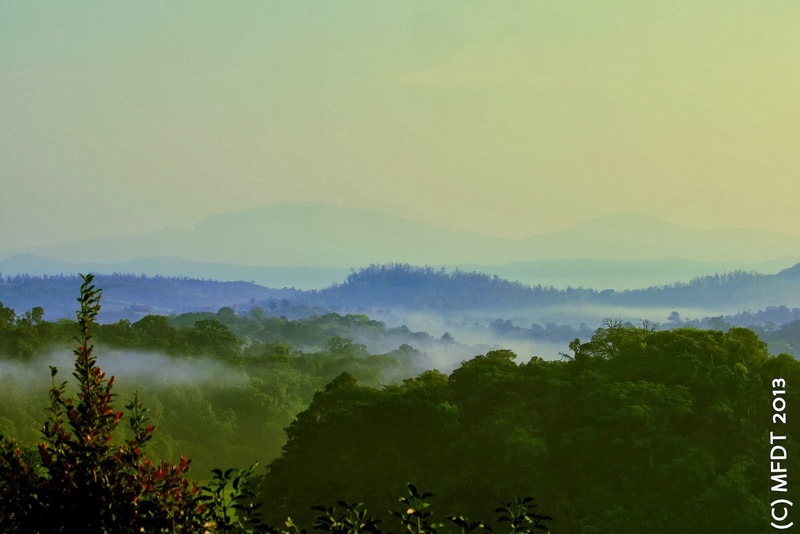 There are many places in India one could describe as 'breathtakingly beautiful' but for Coorg this alone doesn't suffice. It is one of the few places which has been so favourably endowed by the Nature and has managed to preserve much of its pristine beauty. Strangely however, in terms of the parameters of modern development, Kodagu is considered to be a backward district. For me however, in some fictional narrative, the place could serve as a magical country in its own right. It has a language of its own but no script. Coorg was also an independent state of India till it was merged with Mysore after States Reorganization in 1956. It has a distinct cuisine of its own. It is an important spice region of India and contributes one-third of the country's coffee production. And not just that, the people even have their distinct dressing styles/ costumes/ jewellery. The way Kodagu women wear saree differs from the rest of the country- with pleats at the back, it is supposed to make it convenient for them to go up and down the hilly countryside. The people of Coorg, (Kodavas as they are called ) consider themselves to be descendants of the soldiers of Alexander, the Great and hence are known for their martial skills and beauty. Hence the fact that a number of Kodavas have made their mark as India's defence personnel, athletes, actors etc shouldn't come as a surprise. Our friend An took immense pride in informing us about the Kodavas Annual Hockey festival, the existence of three astro-turfs and four eighteen hole golf courses in Coorg! We were also surprised when he decided to shed light on Section 4 of Arms Act of 1954 which read with another notification actually exempts all "persons of Coorg race" from going through the usual process of obtaining an Arms license! Whatever be the reason or excuse, we were smitten by the beauty of the place, the first time itself. But this time as we walked amidst the floating clouds (and lived in the middle of a cardamom estate! ), we felt we had to bring our parents to Coorg or else they may never know such a place actually exists in India. The fact that the renovation of An's house would also be complete shortly, seems to be an incentive strong enough..